The Anatolian Adventure Tour is a spectacular tour which takes you from one side of this amazing and diverse country to the other. The tour will take you back in time through early Christian settlement in Anatolia and then back to Old Testament times and a world peopled by the ancient Hittites, Urartians and the Old Testament Patriarchs such as Abraham and Noah. From Istanbul, in the luxury of air conditioned railway carriages and by coaches to the borderlands of the east with nomads and their flocks of sheep and goats this is not just a journey from one place to another, it really is a journey through time. The Anatolian Adventure starts in Istanbul and finishes in Van. The tour is fully inclusive and the cost covers all domestic travel, guides, museum/ site entry, accommodation and all meals (some exceptions noted in tour itinerary in Istanbul). Not included are costs of visa, international travel, soft drinks and alcoholic beverages. Balloon rides in Cappadocia are an optional extra that we are happy to arrange for you. Istanbul, visiting the Topkapi Palace, Aya Sofia, the Archaeological Museum, the Yerebetan Saray, the Mosaic Museum, the Blue Mosque and the Hippodrome as well as a cruise up the Bosphorus to Anadolu Kavagi, the last ferry stop on the Asian side just where the channel joins the Black Sea. Journey back along the Asian side by coach to visit the Beylerbeyi Palace, the summer palace of the last Ottoman Sultans. See the Bosphorus by night on the ferry travelling across to the Asian side to begin your Anatolian adventure. Dinner and then depart from Istanbul's Haydarpasha station in your own sleeper compartment on the night train to Ankara. Ankara. In the morning we will visit the tomb of Ataturk, the founder of modern Turkey. Called Anit Kabir, Ataturk's mausoleum is one of Ankara's major landmarks. In the afternoon the tour of Ankara takes in the Citadel and the Museum of Anatolian Civilisations. Housed in a beautifully restored covered bazaar built in 1471 by the Grand Vizier Mahmut Pasha, and in an adjoining Han of the same period, this is one of the outstanding museums of Turkey. Hattusas, the ancient capital of the Hittite Empire. A walled city, Hattusas is a large site containing many temples (the Hittites had a pantheon of 1000 gods) and a great fortress that held a royal palace which housed the Hittite state archives. In these archives archaeologists discovered, in 1906, a cuneiform tablet on which was written a treaty between the Hittite King Hattusili III and the Egyptian Pharaoh Ramses II. - one of the earliest peace treaties on record. From Hattusas we continue to the UNESCO world heritage site at Goreme. This whole region was an early area of Christian settlement and is characterised by many underground cities, churches and by communities of troglodyte dwellings; houses carved out of the living rock. Mid morning start for the journey to Mt. 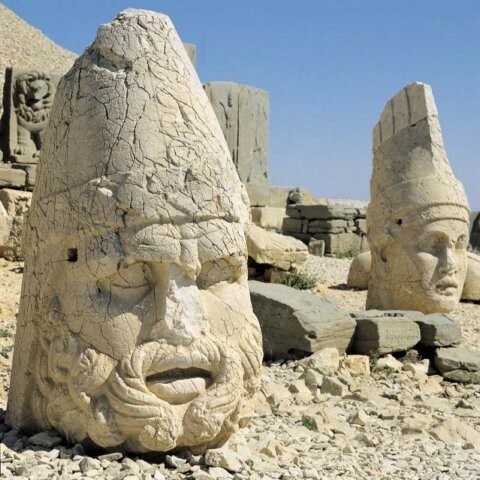 Nemrut in Adiyaman to see the summit and the magnificent funerary monument built by King Antiochus III. Lost for nearly 2000 years and only rediscovered by accident in the 1890s this monument is an enigmatic memorial to a long lost king. Depart for Urfa. En route we will visit the Ataturk Dam, which is part of the South eastern Anatolia Project (GAP). An impressive, huge, hydro-electric and irrigation project on the upper reaches of the Euphrates River. Urfa is called the City of Prophets for its biblical connections. Sightseeing again will be at a pace to enable you to fully appreciate this enchanting city, taking in the castle with huge Roman columns which dominate the top of the hill, The Pool of Sacred Carp, surrounded by architecturally exquisite buildings and the large, green, and floral gardens where we will visit the birthplace of the Prophet Abraham. Comfortable coach ride to Harran, a famous city from ancient Mesopotamian times; a mystical and ancient place of "bee hive" houses built of mud and straw. A short walk from the "bee hive" houses is the ruined site of the first Islamic University of the world. The Bible speaks of this town as the place where Abraham and his family lived. We will visit the on going archaeological dig at Gobekli Tepe. This extraordinary site is the oldest religious structure built by man yet discovered; at 10 - 11 thousand years BC these structures pre date not only Stonehenge and the Pyramids but also writing and the discovery of the skills of pottery. From Gobekli Tepe we carry on to Mardin where you will have time to browse around the shops or take in the sights. After breakfast we will visit Deir-Al-Zafaran (the Saffron Monastery), once centre of the Syrian Orthodox Patriarchy and still an active monastery. Drive to Hasankeyf which has hundreds of caves, hidden waterways, tombs, a larger and smaller Palace, as well as ruins of the Great Mosque. Depart for Tatvan on Lake Van along the Bitlis river gorge. On the south eastern shore of Lake Van we find Nemrut Mountain. This huge volcanic mountain is one of the largest intact calderas in the world. The highest peak of the mountain stands at 3050 metres. There are five lakes within the crater, and the larger two, which we will visit, are wonderfully different. The Cold Lake (13 sq. kms) has an average depth of 100 metres. The Hot Lake has a visible amount of steam rising from its thermal springs, great for a dip if you have your bathing costumes and towels? For those who arrive between June and September we will see and visit the nomadic people who spend their summers around Nemrut Crater Lake, bringing their livestock to the rich pastureland. On to Van, stopping to visit Akdamar Island, with its ancient Armenian Church of the Holy Cross. The City of Van, a vibrant and colourful city. Take time to visit the museum, where there are many fascinating artefacts including carvings, Roman jewellery, arms and armour and ancient head dresses. The city is dominated by its 3000 year old Urartian citadel, almost a mile long. We will take time to explore these rich ruins and watch the extraordinary sunset over Lake Van. Travel to Dogubeyazit, via the waterfall at Muradiye, with its rope bridge. Dogubeyazit, a frontier town, is a very traditional eastern town, where you will be expected to dress conservatively, but again the welcome will be very warm. We will travel just past the town to Ishak Pasha's Pleasure Palace, where the Governor lived in splendour! From Dogubeyazit we return to Van in time for the sunset over the citadel on Van's castle rock. Depart from Van airport for Istanbul and home.